With this product, you earn 54 Reward point(s). 54 points = $0.54. Lotus leaf is a flowering aquatic perennial that grows widely throughout tropical regions of Asia and the Middle East. The pale green leaves are flat and broad, reaching up to 18 inches in diameter. The leaves are usually collected in the summer and autumn and dried before being cut into small pieces, powdered or processed into pills. Lotus leaves are touted to be useful in treating a variety of conditions, including heavy bleeding, diarrhea and muscle spasms. The lotus has historically played an important role in both the religion and medicine of many cultures. According to Plant Cultures, the lotus "has been held sacred in Asia and the Middle East for over 5,000 years." Texts from India dated to the 11th and 12th centuries discuss meals that feature lotus leaves. The resilient plant was considered a symbol of immortality for the ancient Egyptians who also made use of it in their diet. The lotus flower is absolutely stunning, vibrant and magnificent. We all love to look at the flower, but what is the leaf good for? Surely the leaf can’t just be good for nutrients to the soil/pond once the plant dies! Nope, sure i’snt! This amazing piece of the plant has many uses all varying in what they are great for! The leaves can reach a diameter of a whopping eighteen inches! They are collected twice a year in the summer and fall. When they are collected some are dried and some are processed into an herbal extract which is a great astringent! As an astringent, lotus leaf has the ability to stop bleeding, and is used to treat conditions such as blood in urine, blood in vomit, excessive menstrual bleeding. Lotus Leaf Tea helps with anxiety, stress and, helping your liver to be healthy. According to Chinese medicinal history it invigorates the blood and stops internal bleeding for such conditions as blood in the urine. Lotus Leaf Tea also helps with cardiovascular health because it is full of lots of great anti-oxidants and can increase coronary blood flow and lower blood pressure! Bring hot water to a rolling boil and immediately pour over your tea bag. Steep for a good 3 to 5 minutes. Tea bag teas are usually one per cup (8 oz) of tea, though you can always double-up when you want it stronger! Lotus leaf is also great for fighting against ringworm! Thus meaning it is an anti-fungal! So rub a little bit on those toes of yours if you are an athlete! If you are looking to lose weight this leaf can be a great edition to your diet! Studies have shown that this leaf can decrease the absorption of carbs and fats!! This wonderful plant will also increase your metabolism! Those aren’t the only things though! The lotus leaf is classified as a bitter herb and bitter herbs, trigger the production of bile which stimulates digestion. It also triggers hydrochloric acid and the combination of the two being triggered help ease flatulence! Did you know that bile helps assists in the break down of fats? Bile is also a liver tonic, weird huh?. When the lotus leaf works as a fat blocker, it breakdown current fat and prevents new fat by blocking of triglyceride formation. The lotus leaf extract is even used with l-carotene to help obese people start to lose weight in “professional” medical fields! The lotus leaf also has sedative and antispasmodic properties which aid in digestion. It is also filled with Flavonoids and tannins which are alkaloids that are powerful antioxidants that protect your heart! The lotus leaf can also help assist you in your current detox regimen! You see the leaf has the ability of the extract to stimulate and tonify the liver and spleen! Its even used in some over the counter detox supplements!e. The lotus leaf is an all around great part of the plant with is also effective as a cardiotonic, anti-febrile agent, hypotensive, resolvent, styptic, tonic and vasodilator. So ask an herbalist or your doctor if its a great plant to ad to your regimen! Its beautiful flower serves as a beautiful flower to paint, smell, touch and its leaf is even better for you! The long history and varied claims have led to extensive research on the potential use of lotus leaf. According to a study in "Nutrition & Metabolism," lotus leaf extract, when combined with L-carnitine, "might represent a treatment option for obesity-related diseases." The mixture was shown to prevent adipogenesis, the formation of fatty tissue. Research conducted by Japanese scientists had similar results. The study monitored the effects of lotus leaf extract on obese mice for five weeks. The results showed that lotus leaf slowed the absorption of fat and carbohydrates, increased energy expenditure and accelerated lipid metabolism. Lotus leaf also prevented the increase of body weight. Lotus leaves contain high concentrations of phytochemicals, compounds produced by plants to defend themselves against bacterial and fungal infections. 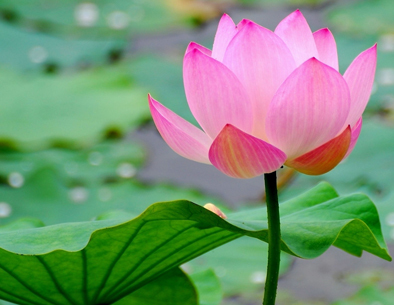 The substances found in lotus leaf extract include alkaloids, flavonoids and tannins. The isoquinoline alkaloids in lotus leaves have sedative and antispasmodic properties, which may aid in digestion. Both flavonoids and tannins are powerful antioxidants that have been connected with weight loss and cardiovascular health. Dried lotus leaf can be used in preparing a meal, though it has a bitter flavor. The leaves can also be brewed into a tea. Lotus leaf is also available in capsule and pill form, which can be taken as an alternative to the bitter leaves. There is a lack of research regarding the effects of lotus leaf in pregnant women and it should be avoided. Lotus leaf may cause gastrointestinal irritation. Lotus leaf may increase the risk of bleeding and should not be used in conjunction with blood thinners, including aspirin. Consult your doctor before beginning treatment. Fill a quart pitcher or container with cold tap water. Cover. Let stand at room temperature or in the refrigerator. Add 4 to 6 tea bags or 1 Family Size tea bag (remove tags). After at least 6 hours (or overnight), remove tea bags, squeezing against side of container. When ready to serve, pour into ice-filled glasses. Makes 1 quart. Recipe may be doubled. Some individuals may have adverse reactions to certain plants, herbs, and other natural products. you are advised to discontinue use and consult your pharmacist or herbal medical doctor. When speaking to your doctor or pharmacist you may find it is helpful to take a copy of this MHRA advice about the product with you. You should continue to take any medication prescribed by your doctor.